1. Wing-footed, having wings on the feet: Alipeds, like Mercury (the Roman god that served as messenger to the other gods) and Hermes (the Greek equivalent of Mercury) were considered to be swift-footed because they had wings on their feet. 2. In zoology, having the toes connected by a membrane that serves as a wing: "Bats are known as alipeds or cheiropterous (hand-wing) animals." Having feet or legs in the form of serpents, serpent-footed: Certain giants of ancient mythology were called anquipeds. One of a group of perching birds that have the middle toe, more or less, united to the outer and inner toes: One example of an anomaliped bird is the kingfisher. Anomaliipods is another term for those birds whose middle toe is connected to the exterior toes by three bones, and to the interior toe by just one bone. A reference to walking or running with two feet: Humans are best known as bipedaling creatures. Some people are known as bipedaling monoglots (two-footed people who speak one language) or bipedaling polyglots (two-footed people who speak many languages). It is obvious that the animal below is a more bipedaling horse than the usual quadrupedal ones that people normally see. An unusual example of a quadrupedal horse transformed into the most bipedaling runner ever seen. The normal functions of two feet as with humans and birds. 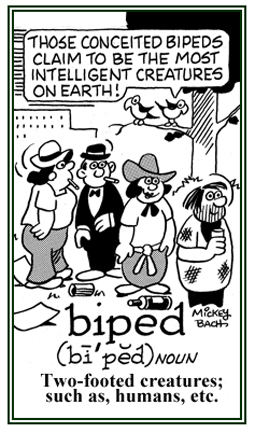 A term for measuring distances by walking or pacing: The worker used a method called bipedality to indicate a certain distance as he counted his steps from one point to another one. Ted's gardner was seen striding five bipedalities from the wall and then he started to dig a hole for a new tree. Having short feet: There are some people who have brevipeds that are smaller than normal. A reference to the head and the feet. 1. Having feet like those of a goat. 2. Goat-footed; such as, a satyr. A satyr, with goat feet. Relating to the hand, wrist, and the foot (in carpopedal spasm, a term applied to the local convulsions which affect the hands and feet of children). Spasms of the hands or feet that may be seen in association with hypocalcaemia or hyperventilation. Hypocalcaemia is abnormally low calcium concentration, which can result in muscle cramps, abdominal cramps, spasms, and hyperactive deep tendon reflexes. Hyperventilation refers to the depth and rate of breathing which is greater than that required by the needs of the body. Such a condition can cause dizziness and tingling of the fingers and toes. Showing page 1 out of 11 pages of 160 main-word entries or main-word-entry groups.